After spending the last four or five months finishing the book and working on my new company website I have taken a short job doing debug and startup on some machinery. 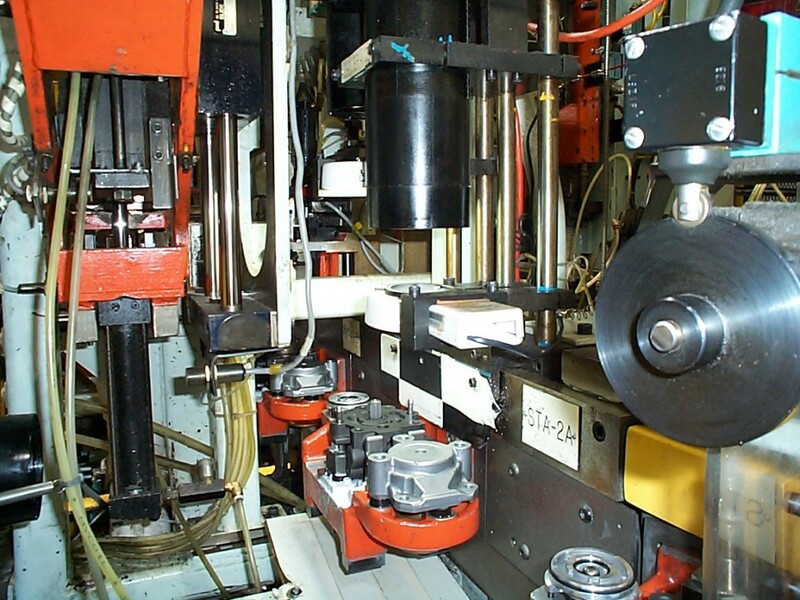 The picture above is from a machine I worked on in the early 2000s that bears no resemblance whatsoever to these machines. Since its not nice to take pictures of companies’ machines when you don’t have permission and I figgered I ought to put something up there, there you go. I described a little of the debug process less than a month ago, but it works a little bit differently when you are doing a startup. When starting up a new machine you can’t assume that the wiring or the program are correct, so you have to be much more methodical. After powering up the machine for the first time, I generally start by downloading the PLC (or other controller) and HMI programs so that I can monitor I/O via pushbutton indicators or dedicated I/O screens. I usually have an I/O worksheet generated during design to use as a checklist, however when starting up someone else’s design sometimes thats not available, in which case I simply use a written list taken off of the schematics. After all of the inputs are verified I make sure the guard circuits are working. At this point all of the guard door, E-Stop pushbutton and light curtain inputs have been verified, so next is the safety circuit itself. Now days safety circuits are generally dual redundant self-monitoring circuits, which can take a bit of troubleshooting if the channels are crossed. These types of circuits also monitor the safety relay contacts through another set of pins, so there are a number of places where mistakes can be found. This is also a good time to check permissives in the output coding. These ensure that an actuator can’t be moved if it would hit another actuator. Usually this consists of a sensor contact being placed in series with the output coil in a PLC program. Additional messaging may be present to inform a machine operator that they have attempted to perform an illegal action and will be executed if they try it again. After all of the actuators are working in manual mode I generally move on to motors. Overloads are set, VFD parameters entered into the drives and motors are “bumped” to ensure they rotate in the desired direction. Three phase motor directions are reversed by switching any two motor leads. If code is present in the controller for speed control via analog or communications that can also be tested here. Servo startup may involve tuning the servo motors for some systems. This may involve decoupling the load for preliminary tuning and then tuning the motor with the load attached. This varies widely depending on the servo platform used. There are a wide variety of other auxiliary devices and systems that need to be started up independently of the main machine or controller. This includes robots, vibratory feeders, test equipment such as leak testers, machine vision and packaging or material handling equipment. All of these involve I/O handshaking with the controller in addition to running them by themselves. After all of these steps have been satisfactorily completed the machinery can be put in automatic mode and stepped through the programming. This is where everything begins to come together and the machine starts to become a living breathing entity. It may also be where the machine tries to show you who’s boss and needs to be put in its place. Regardless, I still think its the best part of my job!